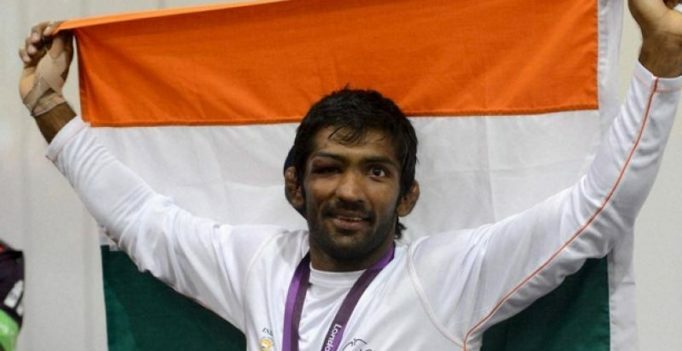 New Delhi: Indian wrestler Yogeshwar Dutt’s bronze medal from the London Olympics has been upgraded to silver after second-place finisher late Besik Kudukhov of Russia was stripped off his medal for failing a dope test. “This morning I came to know that my Olympics medal has been upgraded to silver. I dedicate my medal to people of the nation,” Yogeshwar tweeted. As per Russian agency, flowrestling.org, the four-time world champion and two-time Olympic medallist Kudukhov, who had died in a car crash in 2013 in southern Russia, was found to have used a banned substance in a test conducted by the World Anti-Doping Agency (WADA). As a result, Yogeshwar, who had bagged a bronze medal in men’s 60kg freestyle category in the London Games, has now joined Sushil Kumar as the other silver medallist wrestler from the 2012 Olympics. Yogeshwar, who had bowed out in the first round of men’s 65kg freestyle at the recently concluded Rio Olympic Games, had lost to Kudukhov in the pre-quarterfinals at London. But once the Russian advanced to the final, Yogeshwar got another chance in the repechage round and went on to win bronze.